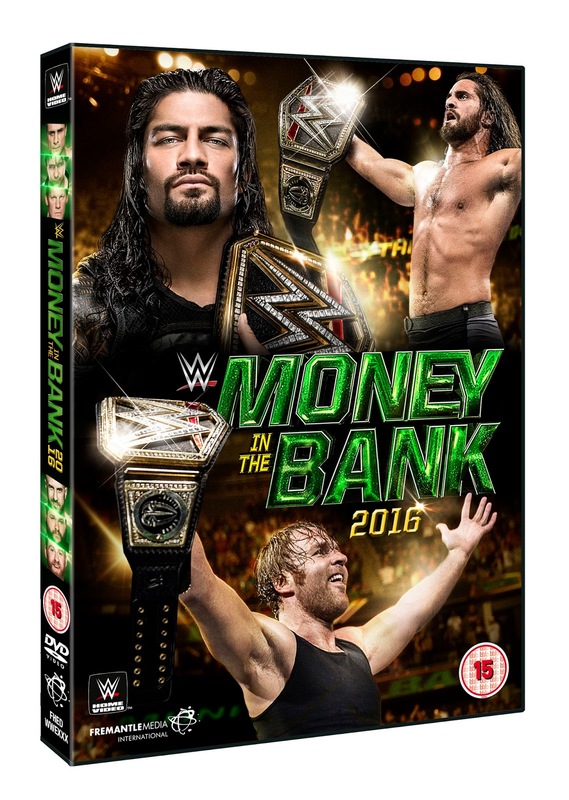 WWE Money in the Bank 2016 is out now on DVD and Blu-Ray, from WWEDVD, Amazon, Base and all reputable home video outlets, priced £12-£23 on DVD. The release features the full Money in the Bank PPV, with around 3 hours of wrestling content, which unfortunately means there is no space for any special features on the disc. However, there is Seth Rollins challenging Roman Reigns for the World Heavyweight Championship, John Cena battling AJ Styles, a Six Man Ladder Match for the eponymous Money in the Bank contract featuring Chris Jericho, Cesaro, Kevin Owens, Sami Zayn, Dean Ambrose and Alberto Del Rio and more, so this disc has to be well worth the money from your bank, right? John Cena and AJ Styles first ever clash, in the semi-main is arguably the match of the night, as the pair wrestle a clever contest. Styles dominates Cena and always appears to have an answer for The Cenation Leader's signature offence, with this becoming the bouts main narrative thread. 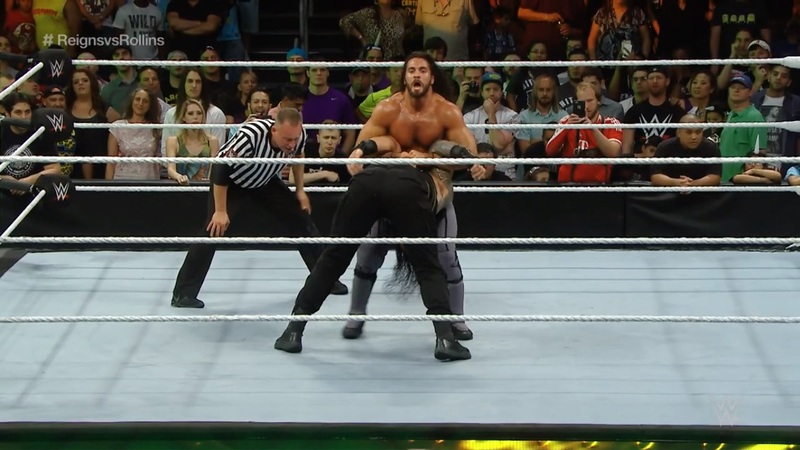 The finish leaves things open for a future rematch, and with the duo seemingly never breaking into their top gear here, but doing more than enough to get the Las Vegas crowd whipped into a frenzy, that will be something you should be very excited about come the conclusion of the match. Rounding off the upper-card, Chris Jericho, Cesaro, Sami Zayn, Alberto Del Rio, Kevin Owens and Dean Ambrose battle in a Six Man Ladder Match, with the Money in the Bank contract on the line in a fun spot-laden contest. The best spots of the match comes from rivals Zayn and Owens who get to continue their feud with some nasty moments, whilst Cesaro puts in the contest's strongest performance. The final few minutes felt a little anti-climactic, with a construction of ladders never quite living up to the initial excitement, meaning that the finish seemed to be missing something. The mid-card is highlighted by a stellar Fatal Four-Way Tag Team match, that sees Enzo & Cass, The Vaudevillains and Gallows & Anderson all going after The New Day's Tag Team Championship. After Enzo & Cass and The New Day cut comedic promos, the match keeps a good pace, with some sterling booking and featuring a variety of exciting sequence and spots, involving all eight men. Baron Corbin taking on Dolph Ziggler has some lovely moments where the two appear to be clicking, but also features some slip ups and an awkward ending. Things aren't help by the audience, who whilst beginning to warm in the final stages, are mostly silent for the first two thirds of the bout, apart from a mild "Boring" chant a few minutes in. Natalya and Becky Lynch team against Women's Champion Charlotte and protege Dana Brooke in a decent bout, but it's the post-match shenanigans that are the most interesting part. It takes a while Sheamus and Apollo Crews to get going in their bout, but the match develops into a hard-hitting scrap that features some big spots and a sweet finish. Rusev defending the United States Championship against Titus O'Neil, starts off well with a brawl on the outside, but it quickly becomes clear that O'Neil is out of his depth as he struggles to keep up the pace in what is the worst match on the card.